If you are dealing with the troubled hotel asset of any kind, The Lenders Handbook for Troubled Hotels will be an invaluable guide for you. 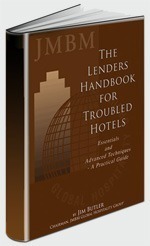 This comprehensive, easy-to-read, 98-page book is FREE from the hotel lawyers at JMBM's Global Hospitality Group®. Although dedicated to lenders and owners, because of our substantial practice in representing them with hotels, we also represent owners and borrowers, and this resource is certainly a "must read" for them. What is your interest in the Lenders Handbook?